rain, rain & more rain non stop........maybe stop for a while for a break or refill !!! and then more rain and rain and rain. Dari pagi tadi sampai ke petang hujan saja. I reached stadium around 5:20pm and it was still raining....hujan rintik rintik lah. I saw a few runners running in the rain including Z.M. If he can run in the rain....aku pun bulih buat. I managed to run 5.01Km in 27:40mins and managed to burnt 342 calories (information from my Garmin Forerunner). Eventhough my time is still good but I feel that my performance drop sedikit due to one week of no running. 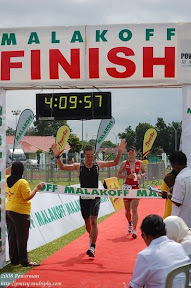 I only have less than 7 weeks to practice for KL Marathon. Yeaahhhh, I've registered for 21Km half marathon for the upcoming KL Marathon on 30th March 2008. Tapi alum tau for sure ke sana.....at the moment, training saja lagipun early April ada 21KM half marathon in Brunei. Keep on running......no hot sunny day, no rainy day, no snowy day (ada kan), without the sun to shine on the path....I will still keep on running in the night as long as there's street lights to guide me to the running path.....eeeseeehhhh!!!! !